Infuse your everyday style with more color, more pattern, and more personality. 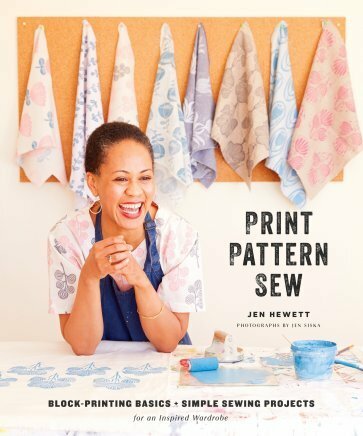 Printmaker and textile designer Jen Hewett presents her distinctive process for block-printing yards of fabric with garment sewing in mind. Explore the process of designing and printing fabric through step-by-step instruction on carving blocks and printing pattern repeats. Hewett makes creating custom, hand-printed fabric approachable and doable. Inspired by her California home, Hewett's designs reference the plants and landscape around her through botanical motifs, organic shapes, and a bold graphic quality. Paired with a playful use of color, the pattern designs here offer the perfect place to start with block-printing. Once you've printed your fabric, it's time to sew. With sewing patterns for simple garments and accessories, you'll discover the play between fabric and finished project and work toward building a highly customizable wardrobe. With step-by-step photos, clear instructions, and full-size sewing patterns, this is a complete guide to sewing clothes that truly reflect your style and personality.